If you were to lose power in your home for three days, what would you eat? Food from the refrigerator? No longer good. Food from the freezer? Not an option either. Microwave something? No power, remember. Maybe you should start thinking now about what you could cook from the ingredients you have in your disaster readiness kit or your kitchen pantry right this moment. Take a look around, what do you have? You can heat that can of ravioli up of a fire, same for the baked beans and cans of soup. But don’t stop there, think harder. What can you create from these items? Well, I’ll be honest; my go-to comfort food is chicken pot pie, it’s perfect for sad days, cold days, and really ANY day. And yes, I know there are no two people that make it exactly alike, but I have to say my mother’s recipe is pretty fantastic. However, if my power is knocked out for several days on end I’m not going to be able to use those chicken breasts in the fridge or make pie crust from scratch like the recipe says. I will be able to make my disaster ready chicken pot pie though. Check out how using canned ingredients can create relatively the same meal. Mix the pie crust according to instructions. Heat over an open flame. Break canned chicken up with a fork. Mix with vegetables (don’t drain) and soup. Season to taste. Fill pie crust with mixture and heat until warm. Now that sounds more like a family meal. Be creative, but plan ahead. When making your disaster readiness kit plan meals ahead that will feed your whole family. Canned ingredients may seem simple, but they can make some of the best meals. What did you find when you looked in your fridge? Share with us some of your disaster ready meal ideas. We are rolling out something new this week, Family Preparedness Fridays. Each Friday we will highlight a way you can get your family prepared for a disaster. What better way to help get the family prepared for the next disaster than to get the kids involved. 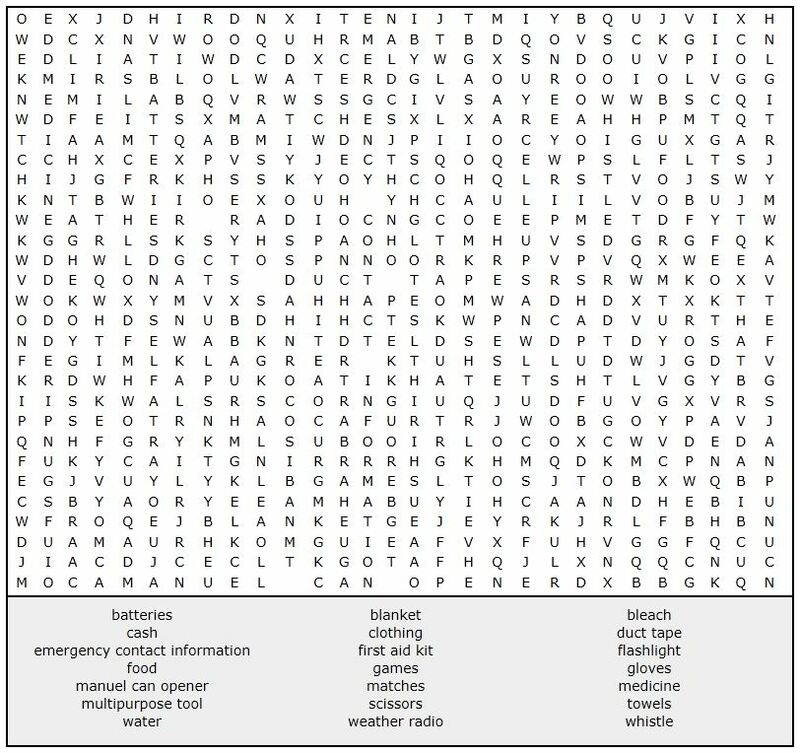 Have the kids help complete the word search below, then use the word list as a starting point for collecting items for your family’s disaster preparedness kit. Most of these items can be found around the house, so grab a box or tote and let the family start getting prepared! To complete this puzzle online click here. For a printable PDF click here. More resources on Family Preparedness are available on the EDEN website by clicking here.